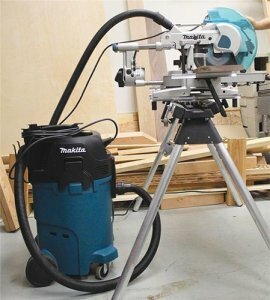 Makita has been making a real effort to offer dust collection accessory options for many of their new tools, which is something I really like, but until now they have been without an actual dust extractor of their own. So what does Makita and their new Xtraxt Vac (VC4710) have to offer? As we have seen, designing a good dust extractor is not something that is easy to do, which is probably why they cost more than your typical shop vacuum. But if Makita's cordless vacuum is any indication of what to expect, I think we are in good hands. When Makita first started announcing their dust collection accessories I wondered why they didn't have a vac to make up a complete system. Now that the Xtract Vac is here (well almost) we can see that Makita has amassed a full range of dust collect attachments for most of their woodworking and concrete tools. Gross container size 12 gal. Includes Vacuum, main flat Nano filters, fleece Nano filter bag, disposal bag, 1-3/8" x 16' anti-static hose, crevice nozzle, cuff adapter. Dust management on the jobsite can be a real challenge. Not anymore. The Makita Xtract Vac™ sets a new standard in portable commercial vacuums. Features a powerful 12 AMP motor, 135 CFM of suction, optional HEPA filter, and more. Filter replacement is the #1 maintenance cost associated with vacuums. The Makita Xtract Vac™ has an Auto-Filter Cleaning System with blow-back feature timed at set intervals to maintain filter performance for longer filter life. More woodworking means more dust. The Makita Xtract Vac™ sets a new standard in dust management for woodworkers. Features a powerful 12 AMP motor, 135 CFM of suction, optional HEPA filter, and more. The total Xtract Vac™ system by Makita gives you a concrete dust extracting solution. 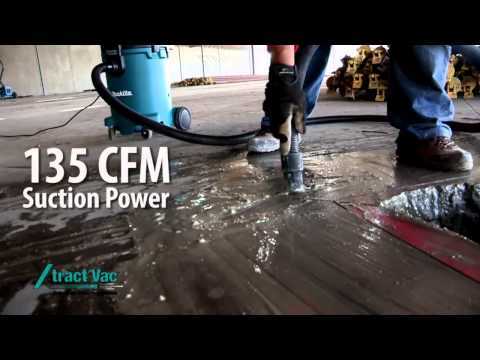 With a powerful 12 AMP motor, 135 CFM of suction, optional HEPA filter and more, the Xtract Vac™ is engineered to reduce the amount of concrete dust on the jobsite.